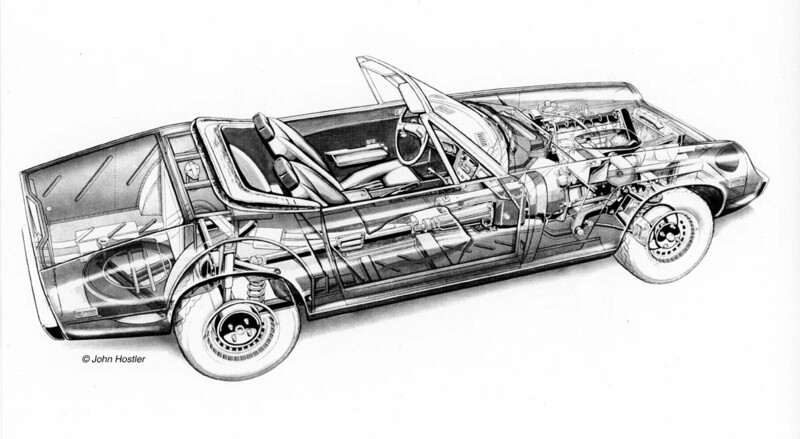 When the Jensen Healey was introduced in 1972, two Jensen Healey cut-a-way drawings were completed. The first drawing was by Jensen Motors’ in-house senior draughtsman / designer, John Attrill. The other was completed by Autocar’s artist, John Hostler. Both were finished and published in 1972. The two men dealt with their cut-a-way drawing in different ways. Today, both remain iconic cut-a-ways. Left click to mouse to supersize. 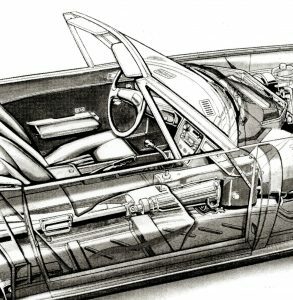 This was completed for Jensen Motors’ new brochure for the Jensen Healey, which was published in February 1972. Attrill was a particularly competent draughtsman / designer who had joined Jensen Motors in the early 1950s. Attrill was one of the few draughtsmen who moved over from the Carter’s Green factory, to Kelvin Way. The brief for Attrill’s cut-a-way drawing was to show the drive-line and suspension in the best way possible. Having been asked by Autocar to undertake a cut-a-way drawing of the Jensen Healey, Hostler went up to Jensen Motors for a one day visit. According to Hostler, the Jensen Healey cars available to him were all left-hand drive cars being made ready for the American market. Hostler was later to mention, “all the cars I saw were USA spec with Stromberg carburettors, so that is what I represented in the cut-a-way.” Hostler remembers that he had just one day to complete what ever work he needed, in readiness to coming back to London to finish the drawing. He made notes and sketches, and took photographs. Hostler even took photographs of various body panels, as he wanted to show the nature of their fabrication. The finished Hostler cut-a-way was an interesting ‘transparent’ view of the car, as though you could see straight through the panels. It worked very well. The Jensen-Healey was produced between 1972 ans 1976. This British two-seater convertible sports car, was the best-selling Jensen of all time. In total 10,503 (10 prototypes, 3,347 MK.I and 7,146 MK.II) were produced by Jensen Motors Ltd. in West Bromwich, England. A related shooting-brake version, the Jensen GT, was introduced in 1975. The prototype (now owned by the Jensen Museum) converted from a Jensen Healey. Jensen Motors launched the Healey in 1972 as a fast and luxurious convertible sports car. The car was positioned in the market between the Triumph TR6 and the Jaguar E-Type. The 50/50 weight balance achieved by the use of the all alloy Lotus 907 engine led to universal praise as having excellent handling. However, the engine had not been thoroughly tested, leading to a huge number of engine-related warranty claims against the MK.I version. Many of those issues were ironed out by the time the new MK.II came to market. REQUESTS: The Museum would like to make contact with John Attrill, or family.